As a rule, the Tusk is scrupulously clean of politics. There is a reference in my own blog bio to being a former conservative policy staffer in the US Senate, but that is background and not polemics. I am old fashioned and believe politics is generally if not inherently destructive of sound inquiry. The more political a scientist appears to me, the less likely I am to take him or her seriously. 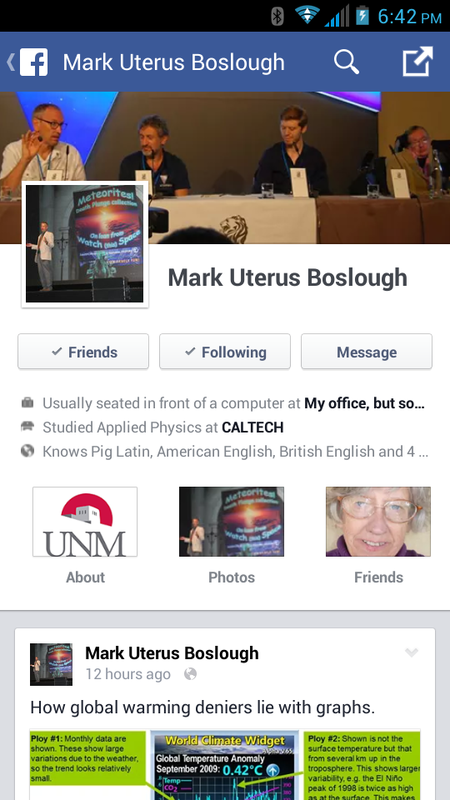 Thus, Mark “Uterus” Boslough. I simply cannot help myself from posting the sad and ridiculous news that The Bos – tormentor of the Younger Dryas Impact Hypothesis and frequent subject of this blog – has renamed himself on social media. If you are wondering, Boslough assumed the “Uterus” appellation out of sympathy for a senator’s failing 2014 campaign. Readers are forgiven for forgetting the election trivia that departing senator Mark Udall (D-CO) was dubbed Mark “Uterus” Udall by his state. Udall’s shameless consultant-driven flogging of an imaginary “War on Women” became a joke — and he got clobbered. Boslough maintains the silly name online today, nearly two months following Udall’s rejection by voters. If you doubt a federally funded media scientist would be so foolish, overt and hyper political, take a look at the Bos’ public Facebook page, or his regular contributions to the Huffington Post. It is pure polemics. No cat pics, hiking in the mountains, or birthday parties for The Bos’ Facebook. Just snarky, condescending, frequently vile and universally left-wing political red meat. And his HuffPo work, which at best could provide informed commentary on threats to all of us, instead proselytizes science as a political tool to damage some of us. For The Bos, politics is not the contest of ideas — It is the justification to silence opposing thoughts. But why should it matter that Mark Boslough is a polemicist with two left feet? It matters because his politics have had a significant negative influence on our favorite topic here at the Tusk, the Younger Dryas Boundary Hypothesis. First, it is well rumored that he was directly responsible for a PBS NOVA episode sympathetic to the ice age impact, “Mammoth Mystery,” being removed without explanation by WGBH Boston and PBS’ on-line streaming service. If true, this was a despicable act of intellectual suppression and digital book burning. I’d welcome hearing The Bos was uninvolved and the decision was inspired by the producers. But I doubt it. Second, his fetish to alarm the public regarding climate change overcomes his assessment of relative threat with regard to cosmic impact – his own field! [Don’t miss the only comment at the link] Boslough is like the smoking oncologist who tells you not to worry about your habit. Death is near: but it is not his problem. The Bos actually makes a living downplaying the seriousness of his own damn subject — while stoking a fever pitch of worry for another! He is cynical 21st century media politics at its best…and science at its worst.